The University of Limpopo (UL), a leader in agriculture and water and sanitation innovation, recently added two new specialised degrees under- and post-graduate programmes to its School of Agriculture and Environmental Sciences. The new degrees are designed to prepare students to respond to meet climate change’s dynamic demands and ever-changing agricultural trends in plant protection and water and sanitation. The programme philosophy in the two programmes, including academic expeditions, will equip students with practical knowledge of the disciplines and enhance their problem-solving, research, oral communication and report writing skills. Accredited by the Council on Higher Education (CHE) and South African Council for Natural Scientific Professions (SACNASP), the four-year undergraduate programme starts in 2018. It is designed to produce innovative and solution oriented scientists who will contribute significantly to the water and sanitation sector as Laboratory Technicians, Operations Specialists, Technical and Scientific Staff, and Research and Development specialists in national and local government departments, municipalities and the private sector. The programme is both inter- and multi-disciplinary and covers plant acarology, entomology, and nematology and plant pathology disciplines, with an option to major in weed sciences. It is packaged to produce cutting-edge scientists and protection practitioners in plant protection, with the four disciplines being available for vertical articulation. The graduates will contribute scientifically to redressing the challenges faced by national and provincial departments of agriculture, science councils, municipalities, and consulting companies among others. 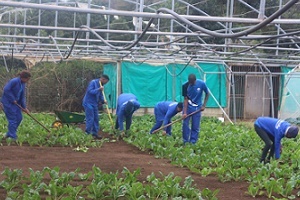 Admission requirements include a BSc Agriculture in Plant Production or an equivalent at NQF Level 8 with at least 60% average final mark in the appropriate major learning area.